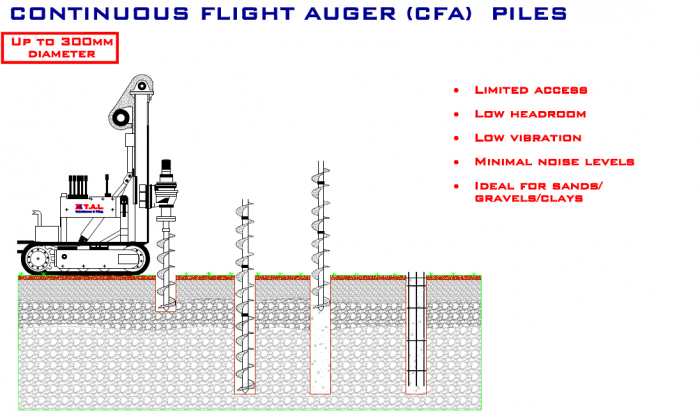 What are Continous Flight Augered Piles (CFA)? A piling technique; a Continuous Flight Augered Pile is a non-displacement pile used in difficult ground conditions. The drilling process is suitable for use in dense layers and is resistant to ground water or unstable soil conditions. CFA Piles are most effective when used in sands with a load capacity developed in both friction and end bearing. The bearing capacity of Continuous Flight Augered Piles is largely affected by the quality of the equipment and the knowledge of the piling operator/piling contractor. The importance of these two factors is often overlooked at the design stage, but plays a crucial role for the performance of CFA piles. This diagram shows the piling procedure : Continous Flight Augered Piles. 1. At TAL, we use the best piling contractors to carry out our piling projects. To start, the CFA pile is produced by drilling a continuous flight auger into the ground. An important feature is that installation is virtually vibrationless and can be used in sensitive situations. The soil-filled auger prevents collapse of the sides of the hole, thus eliminating the need for temporary casing. Whilst the pile bore is being drilled the central stem is plugged with a temporary cap, this prevents soil from entering the hollow stem. Relatively little spoil is removed during this part of the operation. 2. The central hollow stem of the auger is connected by a swivel assembly to flexible steel hoses leading to a high pressure concrete pump. When a satisfactory depth is reached, the temporary cap is expelled. This is achieved by lifting the auger and injection of the concrete. 3. The auger is steadily extracted at a controlled and predetermined rate. Whilst concrete is continuously pumped through the stem, spoil from the bore is simultaneously brought to the surface by the auger and the rising column of concrete. The grout pressure must be sufficiently high and the auger must not be extracted too fast. 4. When the bore has completely filled with concrete the top of the pile is cleaned off and a reinforcement cage with sufficient spacers is inserted into the concrete. 5. The placement of a long reinforcement cage into an uncased hole can pose considerable practical problems and contaminate the concrete shaft with eroded soil. Therefore, it is important that the cage is stiff and properly welded. Limited risk of damage to adjacent foundations or underground utilities from ground displacement or densification of loose sands, as can occur with displacement piles. CFA piles can be installed with little vibrations or noise. Should problems occur during pile construction, it is relatively simple to re–drill and install the pile at the same location, thereby eliminating the need to redesign the pile group or the pile caps. A reliable flow meter can be used to monitor and record penetration / uplift per revolution, auger depth, concrete supply per increment of auger uplift during placing, and injection pressure at the auger head. If the appropriate installation procedures are not followed exactly the pile formed may be of poor and/or inconsistent quality and load carrying capacity. The most critical factor for the CFA system is still its reliance on operator performance, which may result in a pile of poor quality and reduced load carrying capacity. Thus, it is vitally important that experienced personnel install the piles. To ensure success it is vital to give due care to every stage of the field installation procedure, including drilling of the hole, casting of the shaft, extraction of the auger and the placement of the reinforcement. If you are in the public sector, a developer or a contractor, and you are considering working with us in relation to piling and specifically continuous flight augered piles, contact us in our Dublin office on 01 6310300 or in our Cork office on 021 4345999.